Are you pet’s vaccinations overdue? Our Vaccine Amnesty makes it easy to bring your pet’s vaccinations up to date and protect them against preventable diseases. This offer means your pet will receive a full vaccination course for the price of a single vaccination. During your pet’s consultation one of our veterinary surgeons will give guidance regarding your pet’s vaccinations as well as receiving a full health check and physical examination. Why not consider joining out Pet Health Care Scheme for a low monthly cost? Our scheme includes your pet’s routine yearly vaccinations as well as your flea, tick and worming treatment through the year. For more information, click here. What diseases can we vaccinate against? 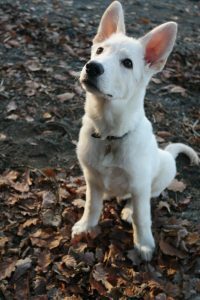 Canine Parvovirus – This disease is caused by Canine Parvovirus type 2 (CPV-2), and is spread through the environment or dog to dog contact. This virus is highly contagious in all unvaccinated animals. Symptoms of this disease may include gastrointestinal signs, anaemia, shock and dehydration. 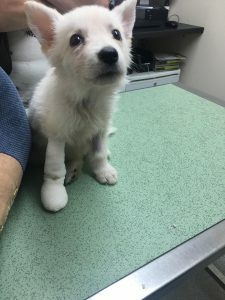 Canine Distemper – This disease is caused by Canine Distemper virus, and is spread by direct contact with affected dogs. Symptoms may include nasal discharge, sneezing, difficulty breathing and coughing. 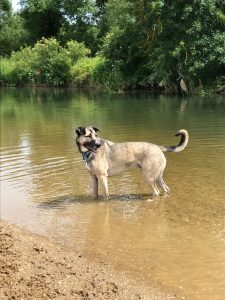 Infectious Canine Hepatitis – This disease is caused by the virus Canine Adenovirus Type 1 (CAV-1), and usually spread via contact with in the environment rather than dog to dog contact. Symptoms may include lethargy, high temperature, gastrointestinal signs, jaundice and painful abdomen. Leptospirosis – This disease is caused by the bacteria Leptospira. 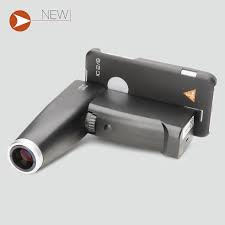 It can be spread by direct contact with infected urine or contaminated water. Symptoms may include fever, gastrointestinal signs, jaundice, dark urine and dehydration. Feline Panleukopenia (Feline Infectious Enteritis) – This disease is caused by Parvovirus and is highly contagious. It can be spread easily from cat to cat and excreted in faeces and bodily fluids. Symptoms can include gastrointestinal signs, fever, loss of appetite, depression and anaemia. Cat Flu – Feline Herpesvirus and Feline Calicivirus are the two main causes of ‘cat flu’. It spreads through air droplets caused when infected cats sneeze, or via nasal and ocular discharge. It can also be spread through direct contact with an infected cat or via a person’s clothing. Symptoms may include fever, lack of appetite, lethargy, discharge from eyes and nose, sneezing and mouth ulcers. 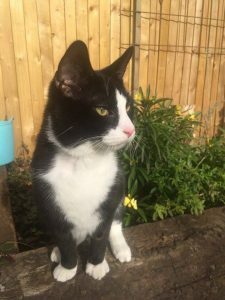 Feline Leukaemia– This virus is found worldwide, and is spread through mutual grooming and bite wounds as it is contained in body fluids. Symptoms can include fever, lethargy, poor coat condition, weight loss, anaemia and gastrointestinal signs. 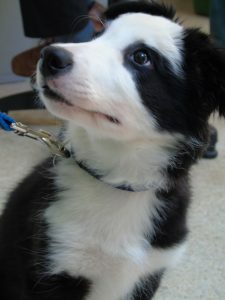 Further information can also be found regarding titre testing in dogs here. Please contact our reception team on 01908 397777 to book your pet’s appointment today! 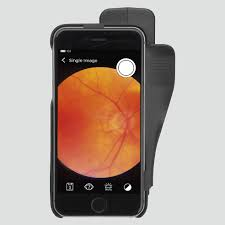 Earlier this year Heine, manufacturers of high quality diagnostic equipment, asked for veterinary ophthalmologists who would be happy to trial their IC2 Fundoscope (more later) for veterinary use. We are delighted to be one of the few General practices in the country who have been asked to trial it. 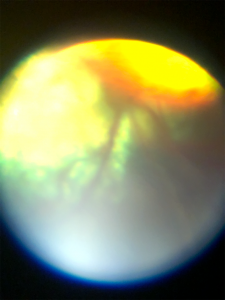 Here are some photos (not ours) of a normal cat and dog fundus. 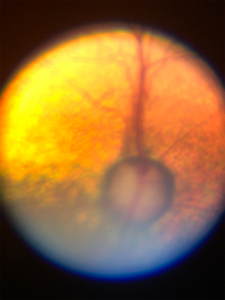 Pictures have been taken from Keith Barnett’s superb Diagnostic Atlas of Veterinary Ophthalmology. You can see how they are much more exciting than the human (primate) ones! 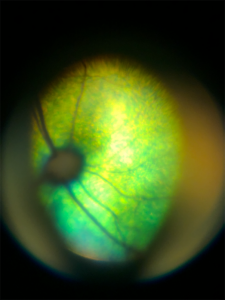 The colourful reflective part is the tapetum, hence “cat’s eyes“ (but could as easily have been dogs). 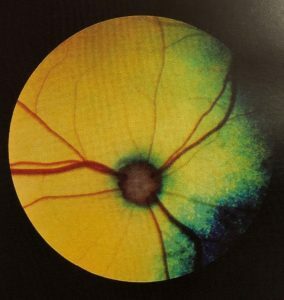 Dogs have blood vessels which cross the optic nerve head while cats do not, a common exam question for veterinary students. The far easier way to establish which species is to check out the animal before you look in their eyes. Here are some photos we have taken. This is both eyes of “Amber” who has been blind in the right eye (LHS) for many years. 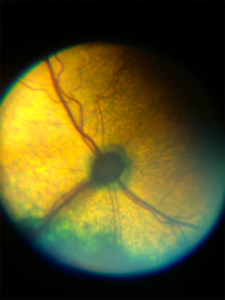 The dark “halo” around the optic nerve head gives us a reason why. 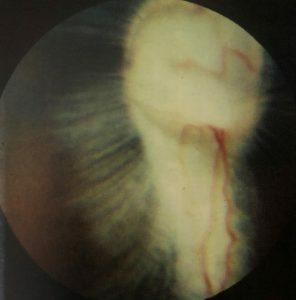 On the LHS we have a bit (oops) of the optic nerve head of a normal young dog. On the RHS we have “Hugo” an ageing cocker spaniel who is unfortunately suffering with retinal degeneration and going blind. 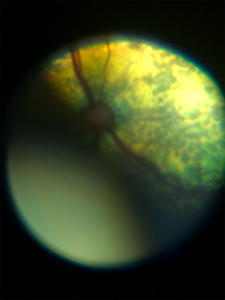 You can see how the blood vessels are much less (atrophy) and the “shiny” part indicates retinal thinning enabling the tapetum to reflect more light. Here we have the right and left eyes of “Mampi” who suffering from hypertension unfortunately suffered a total retinal detachment and haemorrhage in his right eye and partial detachments in his left. 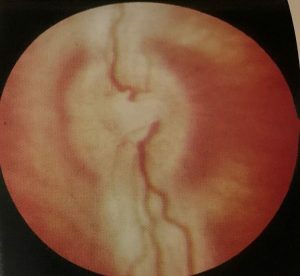 In his right eye the top arrow points to a retinal bleed (post detachment), while the bottom arrow shows “perivascular cuffing” which is caused by leakage from the vessels due to the hypertension. 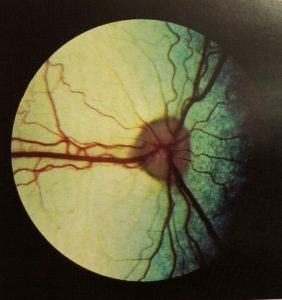 In his left eye we can see dark “dead” patches of retina caused due to bullous (like little blisters) detachments of the retina. These photos are all after treatment which has brought his blood pressure back to normal. His retina in his right eye is now mainly reattached but you can see the damage that has already occurred. 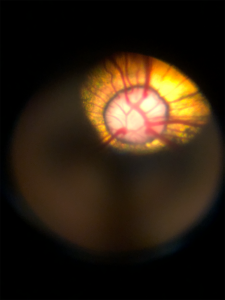 Finally to show that humans aren’t the only species with relatively boring retinae. These pictures from David Williams Chapter 27 in Gelatt’s Veterinary Ophthalmology show two normal rabbut fundi, the left hand one being an albino. 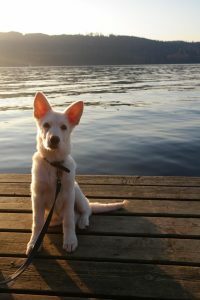 Are you planning to travel with your pet this year? If you are planning to travel in Spring this year, it is wise to consider planning in good time before you go. 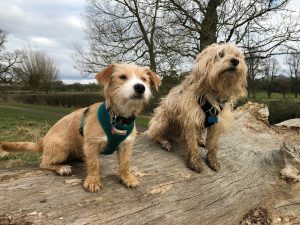 Pets travelling into the EU before 29th March 2019 can do so under the current Pet Passport scheme and will be able to return to the UK as before. This means if you wish to be certain to travel later this year, please contact us for further advice or to book an appointment .